New students at Playfair during Welcome Weekend on Aug. 17, 2018. Record also set for number of graduate students. 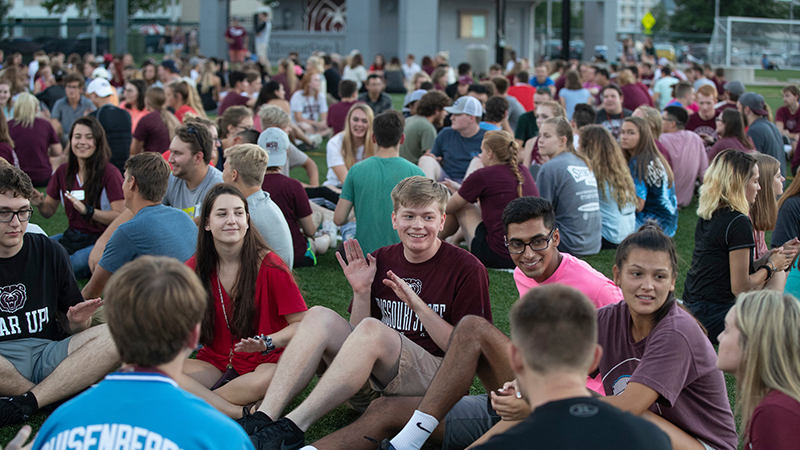 For the seventh straight year, Missouri State University’s Springfield campus has set a new fall enrollment record. Enrollment on the Springfield campus increased by 40 students to 24,390. Enrollment has increased 20 of the past 22 years. The Springfield campus also set a new record for graduate student enrollment, which increased by 5.8 percent to 3,709. “Missouri State University offers an affordable, quality education and we’re pleased that our academic reputation is growing outside of Missouri,” said Missouri State President Clif Smart. There are 26,182 students enrolled in the Missouri State University system. This is the second highest fall enrollment, down 34 from last year’s record enrollment. On the West Plains campus, 1,875 students are taking classes this fall, down 55 from last fall. A total of 83 students are enrolled on both campuses. These students are only counted once in total system enrollment. The fall 2018 official enrollment figures are based on the 20th day of classes, the state of Missouri’s official enrollment census date. Students from all Missouri counties, every state and 78 countries are enrolled at Missouri State this fall. Enrollment of students from other states grew by more than 5 percent to 2,660. Enrollment of dual credit students increased by 120 to 2,928. Dual credit students get high school and college credit for classes they take at their high schools. High school seniors are encouraged to apply for admission early in their senior year and to be aware of scholarship application deadlines. Prospective students are encouraged to visit the campus. The university will host Showcase, a special open house for prospective students, on Oct. 6. For information on the Springfield campus, call 800-492-7900 or 417-836-5517 or visit www.missouristate.edu. For information on the Missouri State-West Plains campus, call 417-255-7955 or visit wp.missouristate.edu.